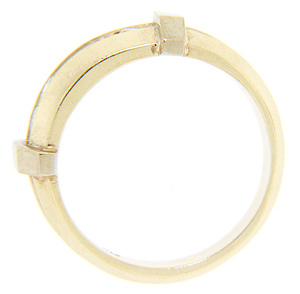 This angular 14K yellow gold vintage wedding band hold five round diamonds set in a horizontal line across the top. 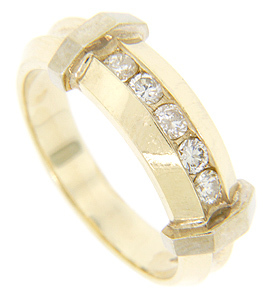 Two raised bars serve as bookends to line of diamonds and add an interesting feature to this ring. The diamonds measures approximately .44 carats total weight and the ring measures 8.2mm in width. Circa: 1950. Size: 8 3/4. We can resize.